Higher education was never going to be on the cards for me as quite an unruly teenager. I was going to get a job straight out of school and go on holiday. And I did. I had a long and often painful childhood that saw me in and out of poverty and with very little a lot of the time. My mother was single and an immigrant that couldn’t read and write English very well. I was one of those children that didn’t have many life chances in terms of education and social status. During high school I skipped many classes and truanted quite often, resulting in either failed exams or not quite getting the grades I had anticipated. In truth, I didn’t really care. Then of course inevitability set in as I grew older and I watched as many of my friends went off to college or university, but I knew that would never happen for me. I wasn’t smart enough or had the patience. I came to live with my good friend in London when I was 18 on a whim and she was nurse. 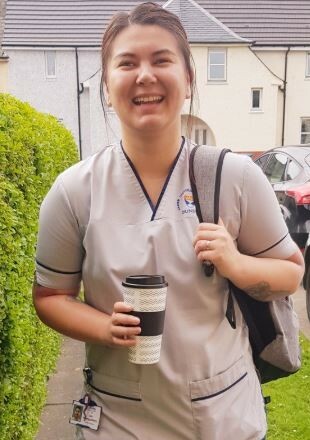 She was like me – bit of an unruly teenager – but her mother forced her to go to university at a time when Scotland’s nursing application rates were so low that they were accepting anyone onto the course that wanted to be a good nurse. She told me she loved nursing and would never do anything else and thank goodness that option was available or else she would’ve never gone into nursing. That conversation made me want to be a nurse but how was I going to do it? This option wasn’t available now and I didn’t have any of the required grades to go straight into University. I investigated access to nursing courses at Fife College and applied at age 21 and to my surprise, got in! During a conversation with one of my tutors, she informed me that I would be eligible to be a SWAP student because of my circumstances – I hadn’t been in any form of education in 5 years. I looked further into SWAP and what a relief. I still didn’t feel that I would be able to get into University but once I learned that SWAP would offer help and support with your chances of getting into University I was elated. A huge weight was lifted from my shoulders. Finally, I began to think that I, me of all people would go to University! SWAP arranged free events at universities for students where we could go and meet university lecturers and see the campuses. They also offered support over the phone and would respond via email very quickly. And all for the cost of… nothing! I remember writing my personal statement to university and the first sentence said something along the lines of “As a SWAP student…”. They took a lot of pressure off me as a very worried student and I am grateful for all their input over that year. I am now a 3rd year Adult Nursing Student at the University of Dundee and am a mere 4 months away from being a registered nurse! I keep in close contact with SWAP and have even been a mentor for access to nursing students twice on their behalf. I also attend any student experience days I am invited to and am always happy to discuss my experiences of how SWAP have helped me. Being a SWAP student gave me the ability to do what I knew I could achieve but didn’t have the confidence to! Sometimes, I still can’t believe what I’ve overcome so far considering where I have come from and with help and support from SWAP my goals of being a nurse have very nearly been achieved.